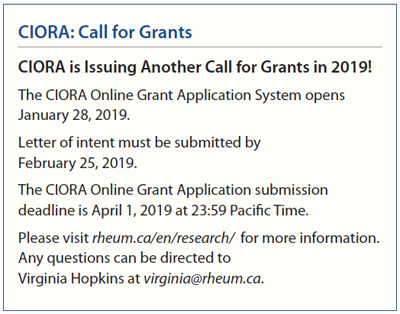 The Canadian Initiative for Outcomes in Rheumatology Care (CIORA) held its 11th grant competition in March, receiving 37 letters of intent as well as 31 grant applications. Congratulations to the 2018 grant recipients! CIORA funded six two-year grants for a total of $670,000. 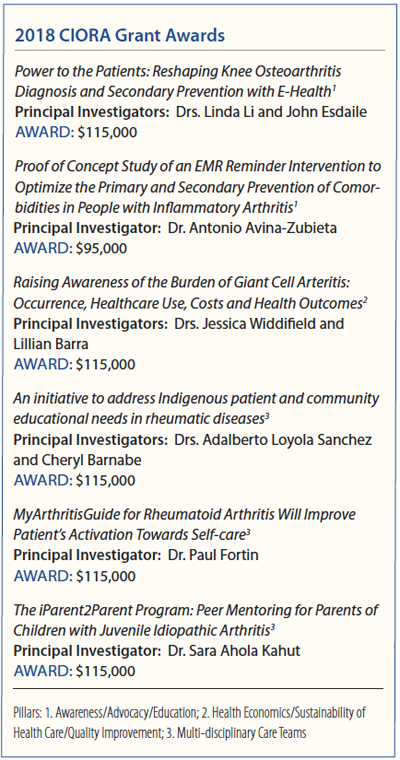 Among this year’s grants, two were awarded for Awareness/Advocacy/Education, three for Multi-Disciplinary Care Teams and one for Health Economics/Sustainability of Health Care/Quality Improvement. Health Economics/Sustainability of Health Care/Quality Improvement is a new sub-pillar which encompasses proposals that focus on cost effectiveness, evaluating care using quality indicators and systems to sustain health care. A special thanks to our sponsors for their continued support.